The name and the picture itself shows how simple and yummy it is. 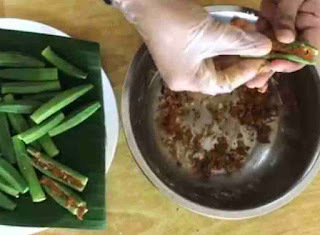 In this lady finger recipe, lady's finger is stuffed with Indian spices and then shallow fried in less oil which results in a spicy crunchy drooling texture. Some Indian okra recipes are absolutely delicious that can make you wanting more. I still don't know why people hates the taste of okra. When prepared properly , this vegetable tastes awesome. You will crave this more, when cooked with Indian spices, i bet. 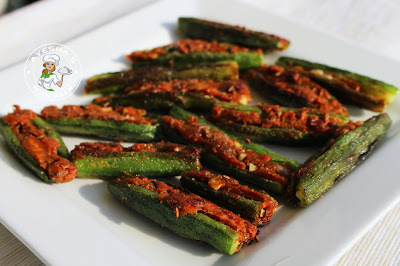 This is one of the most adorable Indian veggie in my home and i love to make simple okra recipes like okra fry, crispy okra, poriyal than making a bhindi curry recipe. . 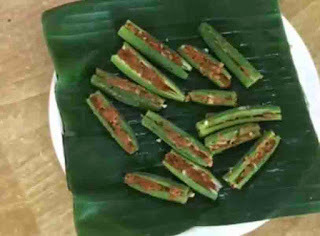 Always try to buy tender okra / vendakka / bendakaya / lady fingers which tastes best for any dish. I used to add okra in my fish curry too or in any dishes with fish. My daughter prefers eating okra from fish curry than having the soft and tender fish. 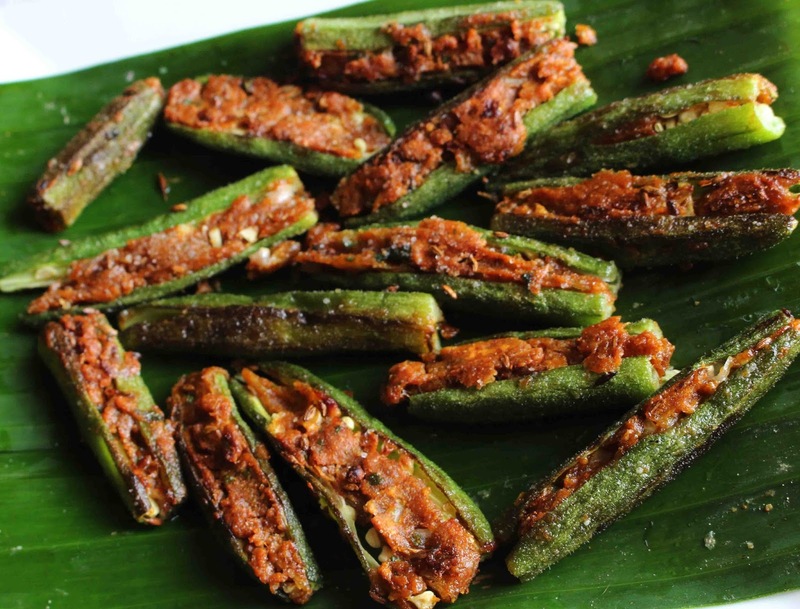 Do try this delicious simple bhindi recipe at home which pairs best with paratha, chapati and steamed rice. 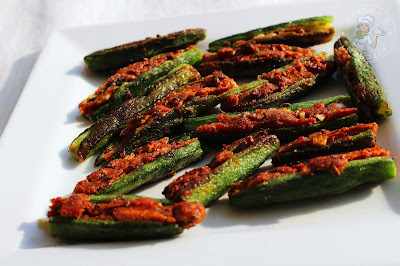 Here is the recipe showing how to make stuffed bhindi / vegan okra recipe / veggie side dishes / easy vegetable side dishes /vegan appetizers /bharwa bhindi . Hope you loved this yummy side dish as much as i do. Wash bhindi / okra well and pat dry. 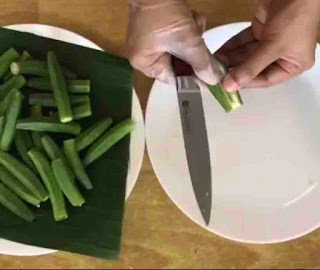 Then trim the edges and cut the okra into a finger length pieces. Then make a slit in the center lengthwise without breaking it into two. In a bowl, combine all the ingredients given under for stuffing with a teaspoon of water. Mix very well. 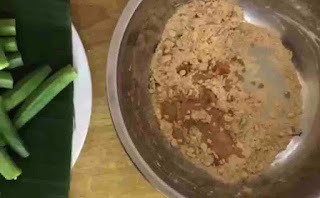 Stuff the the okras with this gramflour mixture and set aside. 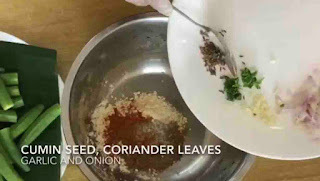 Heat a non stick pan with oil and then crackle cumin seeds. When done, add the stuffed okras and saute well. Sprinkle some pinches of salt all over. 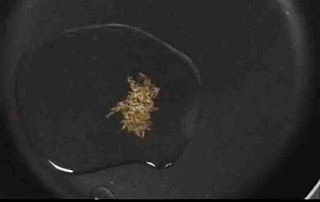 Cook on a low flame without covering the pan for best result. Stir in between, so that it will get an attractive color from all sides. When done, transfer it to a plate. 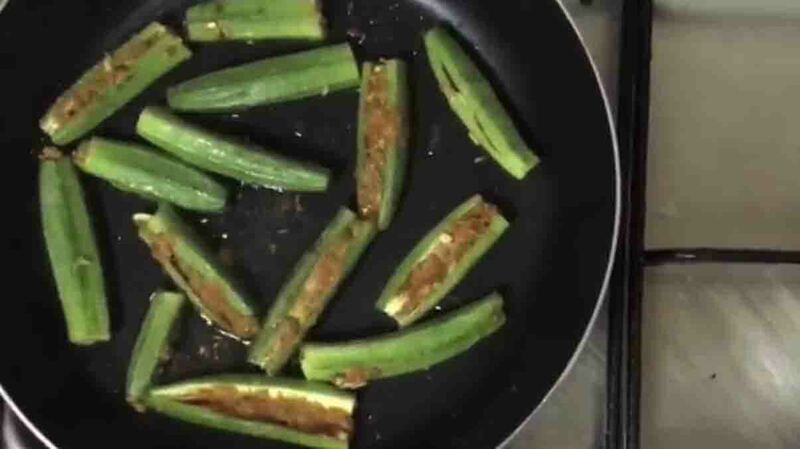 Please click below to watch the video "how to make stuffed okra"